I found this one while looking at the line up for this years SXSW festival. Helvetica, set to get it's premiere at the festival, is a feature length documentery looking at global visual culture and the proliferation of one typeface as part of a larger conversation about the way type affects our lives. 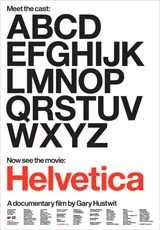 This got me to thinking why our beloved Helvetica Neue exists? Answer: Through its popularity Helvetica needed a more consistent set of weight and widths and in 1983 Linotype set about creating a reworking of the classic. More geekery here. Flash has enabled us to get video online for a while now. It's great to see it used as a creative and innovative way for users to interact with a brand. glue are the most respected digital agency in the UK (official). You may have seen some excellent mini cooper ads, well that was them. The Ave a Word campaign is for a special beefed-up mini cooper that is for manly men, men who are not in touch with their feminine sides, men like Dave who refuse to wear gloves. Apparently mini's haven't been selling all that well to this type of man. Ave a Word is a viral that really engages male users and their mates using personalised video clips compiled from a database according to a few personal details. The video is all shot especially for broadcasting on the web too, so it doesn't look like rubbishy youtube footage. I did one for Dave and heard him laughing from his gut a few times, and he was also bamboozled with the cutting edge technology - very impressive indeed. Do you dream of posters? Works like the good old fashioned flipbook. 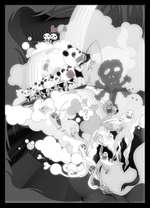 Place each frame of intended ad at intervals throught the underground. The window acts as the screen and the train itself triggers a light to illuminate the relevant frame to watch. AAP site has loads of other cunning ways to get your message across, for example, escalator handrail ads where you scan a barcode into your phone to get more info. Both media would stand out amongst the more traditional advertising down the tube. Fireworks, explosives and tonnes of paint. It took over 300 people 10 days to do this shoot for the next sony bravia ad. It had to be special to be able to follow the San Francisco bouncing balls, so they went to sunny Glasgow - so it's got a more gritty attitude than the balls, and the hit of colour is more intense. Yet again, everything you see actually happens - no shortcuts or CGI. The sequence is directed by Jonathan Glazer who's worked with bands like massive attack and radiohead, thru to full length feature films. The Making Of section on the site is essential viewing. The winners of the inaugural Smalls awards, which, as the title suggests, aim to celebrate filmmaking for mobile phone or iPod video screens, have been announced. The Smalls are initiated by design and production company Devilfish, and are the latest example of a creative company using a competition for subtle promotion of its services, as well, of course, as a means of showcasing new talent to the ad and production industries. I'm showing my age here (27), but for those members of the team young enough to remember the Transformers, they are making a comeback with their big screen debut next spring/summer. As well as checking out the teaser trailer, why not submit a line for the Leader of the Autobots, Optimus Prime, to say in the moive. Your chance to be famous. How about "Enuff is Enuff...I've had it with these Mutha F***in Decepticons on this Mutha F***in plane"